The flowers are from Prima Marketing, the center pieces are from Stampin' Up. I punched the leaves with a Martha Steward punch. The idea to accomplish the flowers with the beautiful swirls Sonja designed came from WoJ Guest Designer Jorunn. I love the flower arrangements she does on her cards. 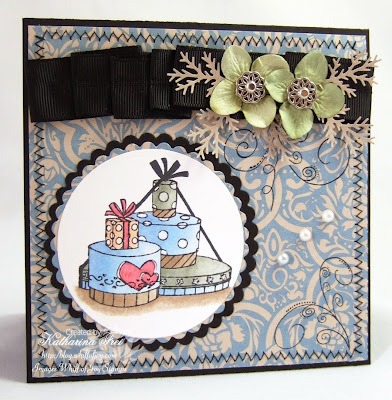 Thanks for visiting, maybe you manage to do a card for CCT this week :) And if you need some more challenges... Donalda designed a fabulous sketch for you at the Whiff of Joy challenge blog. Die Blumen sind von Prima Marketing, das Zentrum von Stampin' Up. Ich habe die Blätter mit einem Martha Steward punch ausgestanzt. Die Idee die Blumen mit den wunderschönen Schnörkeln von Sonja zu vervollständigen kam von WoJ Gast Designerin Jorunn. Ich liebe die Blumenarrangements, die sie auf ihren Karten zusammenstellt. Danke für euren Besuch. Vielleicht schafft ihr es ja diese Woche eine Karte für CCT zu werkeln :) Wenn euch das noch nicht genug Herausforderung ist... Donalda hat einen tollen Sketch für den Whiff of Joy challenge blog designed. Paper: SU cardstock black, dp "Bella Bleu"
very pretty! love the stitching. I love that new paper as well! Lovely card-I love the scalloped circle mats and the image is so cute-must add it to my wish list! 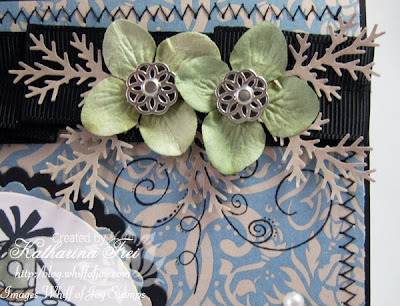 What a lovely card, the ruffled ribbon really looks very effective. die Karte ist ein Traum, wunderschön geworden. Ganz große Klasse. Hello Katharina, I love the way you coloured in the presents and I love the black lace.